Cucumbers, eggplant, an assortment of peppers, a whole basket of heirloom cherry tomatoes, lots of ears of corn, basil, 8 heirloom tomatoes, and one watermelon. Mmmm, eggplant!! 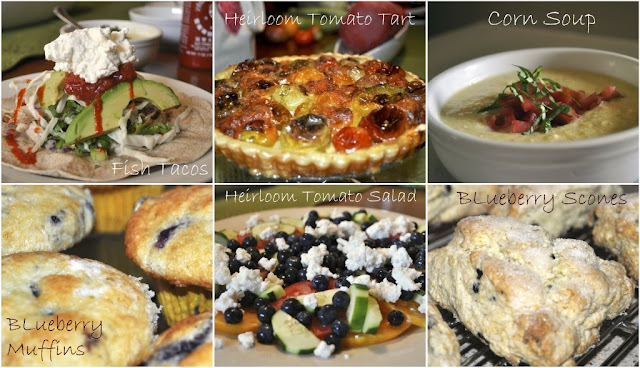 Our kitchen was at full capacity last week, as I churned out recipe after recipe. We ate well and every dish was so pretty to look at! Melon: we ate this first thing in the morning, and we might have enjoyed it more if we had waited a little longer to dig in. It wasn't quite ripe. The tart is so easy and so delicious that you are silly not to try it out. The corn soup was a little labor intensive but totally worth it--I made mine with stock and milk (not just stock, as the recipe reads). While I'm at it, the fish tacos were mighty fine, and super easy. The blueberry muffins and blueberry scones were extra, and we happily shared them with our friends and neighbors. 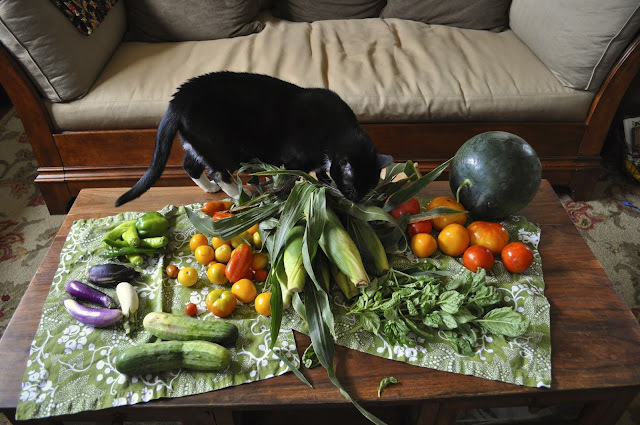 I don't want the Summer, or the CSA to end! !